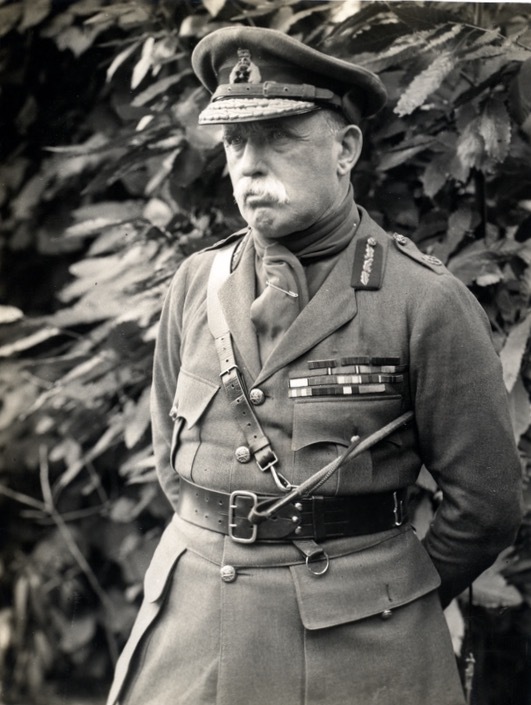 ‘Lord French, Bedford’s most honoured Freeman, paid a visit to Bedford on Thursday and reviewed the troops in training here’ reported the Bedfordshire Times and Independent of Friday, 9 June 1916. ‘When shortly after 11 o’clock he motored over the Old Bridge, it was a different sight which met his eye to that gay scene of flags and bunting when, soon after the Boer War, the popular General came down to receive the Freedom of the Borough with which he has family connexions, and which honoured itself in honouring him. Then we had won the war. Now we are winning our way through the thick of it, and for the moment that is our only concern. The rejoicings will come later. The news of Lord French’s visit had been kept as quiet as possible, and few people probably recognised him in the large car which, followed by a smaller one, motored through the town via Midland-road, and Hurst Grove to the saluting base on Bromham-road where he and his staff were met by the GOC the troops here and staff. ‘At 11.15 the first troops came in sight. They were the Horse; then came the cyclists – both very imposing, the rhythm of the movements of the long line of cyclists being most pleasing. Next followed the Bedford Grammar School OTC, a graceful compliment to the School and the Town. Their marching and appearance was very favourably commented on by those quite unaware of their identity. Major Lucy, who was in command, had an obviously pleasant interview with Viscount French. Then followed the REs preceded by their cyclist section, and it was noticed how nicely the mules behaved. The trained infantry then followed in their battalions, then some more REs before the artillery concluded the march of the trained units. After these came the recruits, whose only equipment was a water sheet rolled up neatly and attached to the belt at the back, or slung across the right shoulder. They marched well, especially considering how short a time they have been in the hands of the drill sergeant. Finally the Ambulance. ‘After passing the saluting base the troops marched on to Bromham Swan, where, according to the location of their billeting area they took the turn to Kempston, and returned that way to Bedford, or went on and marched round Bromham, Oakley and Clapham. The recruits were marched only through Biddenham and returned the way they went. ‘The troops as a whole made a very favourable impression. The animals were in perfect condition and beautifully groomed. In the same edition on the same page, the Bedfordshire Times and Independent also reported on women on the land, demonstrations taking place at Biddenham on the same day, Thursday, 8 June 1916, as the review of the troops by Lord French. It was a very busy day for Biddenham. ‘The demonstrations and competitions by women in agricultural operations attracted good entries and passed off very successfully on Thursday afternoon. It was brilliant summer weather, and it seemed as if all the interest was centering in Biddenham. Interminable columns of troops marched through the village and debouched upon Bromham-road, holding up the visitors, but soon after 2 pm most of them got through, and their numbers increased all the afternoon until there were very large crowds witnessing the operations on the Grove farmstead and in a field off the Bedford road. Most of the onlookers were women of the right class, and they showed the liveliest of interest in the proceedings. The affair was organised under the auspices of the County War Agricultural Committee for men and women, and the three agricultural organisations of the county, with Mrs Arnold Whitchurch acting as Hon Secretary for women, and Mr H Trustram Eve Hon Secretary for men. Mr Chibnall was the tenant of Grove Farm, Mr Whitworth the tenant of Church Farm, and Mr Manning the owner of Green Farm (Mannings Farm), all in Biddenham. The newspaper subsequently printed four photographs of the agricultural demonstrations and competitions in Biddenham in its 16 June 1916 edition.